The above arrived in the packet yesterday containing LA Opera’s season announcement. Yes, it’s hand written. Yes, it’s addressed to yours truly. Yes, that’s Placido Domingo’s signature. Nice touch, wouldn’t you say? I can’t say that I’m quite so jaded that I didn’t get a kick out of it. Odd, Earnest Fleischmann never sent this kind of note to Martin Bernheimer. This kind and personal gesture on Placido. Domingo’s part doesn’t surprise me a bit. Based on anecdotes conveyed to me by people who have met him, he is the ultimate class act, a true gentleman, and a dear man. About 20 years ago, my parents were attending a play at a small equity-waiver theater in West Hollywood (then run by my youngest brother). Needless to say, my parents were floored when Domingo strolled in just before curtain-time and sat down right in front of them. Even more surprising, during intermission the very genial and completely unassuming Mr. Domingo suddenly approached my parents outside and struck up a lovely conversation with them. Of course, I nearly wanted to die after having missed a once-in-a-lifetime opportunity to shake hands with the operatic icon. If only I’d waited one more night to attend that play! 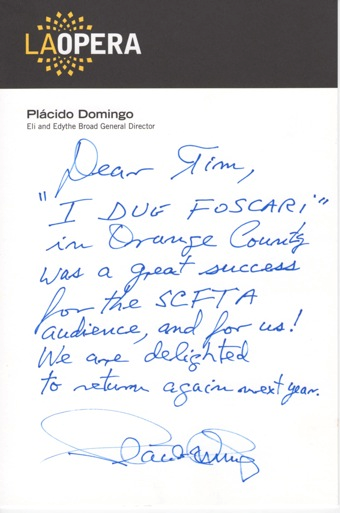 When we saw “Il Due Foscari” back in October, Mom recounted that chance meeting with Mr. Domingo. Needless-to-say, it was a moment she’ll never forget and it illustrates perfectly the kind of sincere and thoughtful man he is. Also, a few years back, a friend-of-some-friends of mine (who works for L.A. Opera) told us what a pro he is and what a privilege it is to work under his leadership.